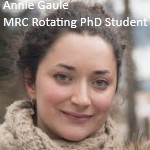 I am currently on rotation in the Affective Brain Lab during my first year of the UCL Four-Year MRC PhD programme in Neuroscience and Mental Health. During this rotation project I will be looking at the influence of dopamine on information seeking behaviour. Before this I studied Psychology at UCL, followed by a Dual Masters degree in Brain and Mind sciences between UCL and the Université Pierre et Marie Curie and the Ecole Normale Supèrieure in Paris. During these degrees I worked on motivation in addiction in the UCL department of Psychopharmacology with Dr Will Lawn and Professor Valerie Curran, and the boundaries of causal perception in infants with Dr Véronique Izard (CNRS) and Dr Brent Strickland (ENS).